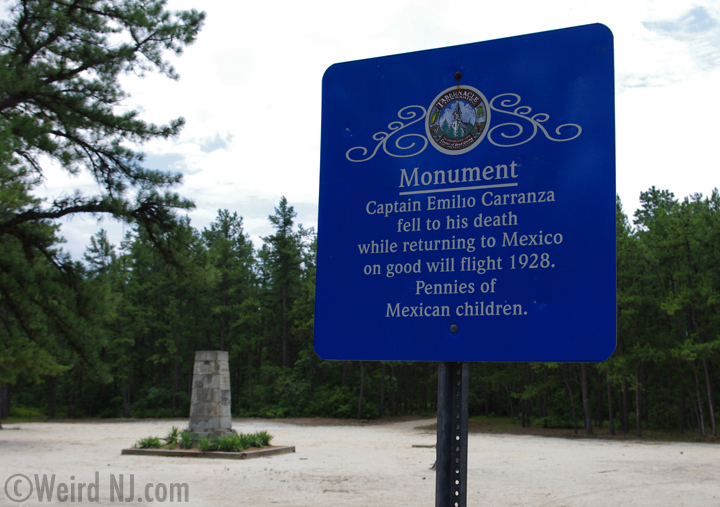 This year marks the 86th anniversary of the fatal crash of Captain Emilio Carranza, the “Mexican Lindbergh,” deep in a remote area of the New Jersey Pine Barrens. It was in the early morning hours of this day, July 13, 1928, that local residents of the town of Tabernacle heard the engine of a small plane stuttering over the vast and lonely wilderness of the during a terrible electrical storm. Piloting the struggling aircraft was a young Mexican captain en route from New York to Mexico City, guided by nothing more than a hand held flashlight. Soon the sound of the engine was heard no more. A bright October day found me driving through the Pine Barrens. I was out to find the Carranza Monument in Burlington County. Marked in red on my map as a point of interest, I had no clue what it was. Some long forgotten settlement? A Catholic shrine? It would turn out to be more interesting than that. 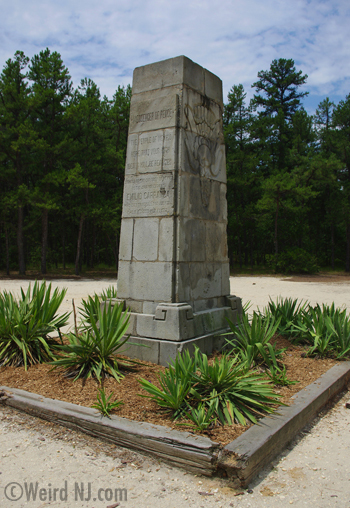 The turn off Rt 206 had the only marker for “Carranza Monument.” Carranza Road cut through the village of Tabernacle and into Wharton State Forest. The trees flanking the road turned from oak to pine, and white sandy ‘roads’ veered off to the left and right, snaking through the scrubby brush. I stopped occasionally to take photos, not pulling off the road. Three in the afternoon, gorgeous day, not another soul in sight. I passed no hikers, no other cars, saw no animals, and heard only crickets. Eventually, I saw signs for “Batona Camp Site” and “Batona Trail” (which is 50 miles long and tracks through several State Parks and Forests. Suddenly, the pavement ended and I was headed down a washboard road of packed dirt. After mile or two of bouncing around, I turned around, figuring I missed a turn. By accident, I looked to the left after passing the Batona Camp. There was a wooden barrier along the road, bordering a sandy clearing. Standing in the middle of this space was a monument surrounded by yuca plants, looking like a chunk of Aztec or Mayan Temple. The Carranza Monument stands in the center of this open space, like a monolith from a National Geographic article about Middle and South American ruins. The sort associated with having your heart ripped out by priests, who then eat it and toss your body down the steps. The face of the stone depicts an ancient looking carving of what turns out to represent a dying bird, with footsteps leading away. The back of the monument had a cleanly incised arrow, pointing to the heavens. There were inscriptions on both sides, one in Spanish, the other in English. 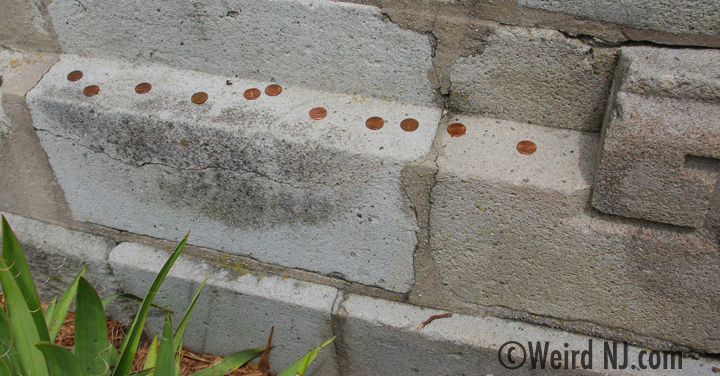 The stone itself was erected in 1930, and a number of pennies were laid out as tokens along the edge of the monument. The weatherbeaten English inscription reported that the monument was erected to the memory of Captain Emilio Carranza. A metal historical marker on the road informed me that Emilio Carranza was ‘Returning from a goodwill flight, back to Mexico, when he fell to his death in 1928.’ The pennies of Mexican children financed the monument to their hero, the stone quarried from Coauila, his birthplace. Captain Emilio Carranza, age 23, was considered the ‘Lindbergh of Mexico.’ He is still regarded as Mexico’s greatest aviation hero and was befriended by Lindbergh. He was the grand nephew of a Mexican president and the child of a Mr. Carranza and a Mrs. Rodriques. Dedicated to his country, and idolized for his ideals and bravery, he had come to America in the summer of 1928 on a goodwill flight, in response to Lindbergh’s flight to Mexico City. During his visit he was nationally honored and greeted in Washington by President Coolidge. He was to return to Mexico in July, but several bad storms kept him grounded, and the American press and public urged him to put off departure. On July 12th, while dining at the Waldorf Astoria in NY, he was called away by a telegram. Immediately he contacted the airport and told them to ready his plane. Captain Carranza’s Mexico Excelsior left Roosevelt Field, Long Island, at 7:18pm, in the middle of a terrible electrical storm, against warnings by the weather bureau and airport officials. Residents of the Pine Barrens, near Sandy Ridge, recalled hearing the sputtering of an airplane engine during the storm. The next afternoon, the wreckage of his plane was discovered by a family out picking blueberries. Emilio’s body was found, still clutching a flashlight in his hand. 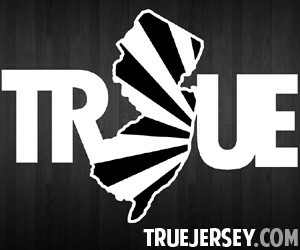 It was believed he was flying low, looking for a clear place to land, when he hit the treetops, causing the plane to flip. In a day when small planes often lacked windshields, it is amazing to imagine someone using a flashlight in order to attempt a landing. The Carranza Monument, in its desolate clearing, marks the place where Captain Carranza’s body was found. Every year on the anniversary of his death, represenatives from the Mexican Consulate in New York come out to honor him, and on the weekend closest to the date members of American Legions Post 11 hold a small ceremony. It was Post 11 who took charge of Carranza’s remains until they were returned to Mexico. On this lonely spot a Mexican hero was ‘martyred,’ as some say. 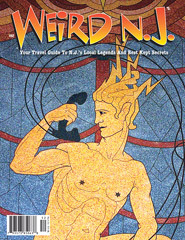 But the uniqueness of the monument and the tragic tale it tells is worth the long trip deep into the Pine Barrens, where Emilio Carranza crashed landed into New Jersey history. I haven’t found any explanation for the strange footprints embedded in the Carranza Memorial. No one seems to know when they appeared or why. We also can’t find any explanation for the pennies people leave all over it. As the local lore goes, if you park your car at the gate, flash the headlights on the memorial three times and yell “Emilio” out the window, you will see his plane. Of course we had to try it. 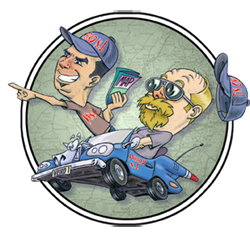 This entry was posted in Mystery History and tagged carranza monument, Charles Lindbergh, Ghost, mexican, Pine Barrens, plane crash, Tabernacle. Bookmark the permalink.